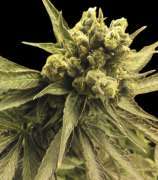 Here you can find all information about the cannabis breeder Dr. Atomic Seeds. We've collected data about 6 Cannabis Strains breed by Dr. Atomic Seeds. Click on the strains to find more informations, pictures, reviews, comparisons and sources for a variety - and/or check out the Breeder Info here at the page to find out more about Dr. Atomic Seeds. Its also possible to visualize all Dr. Atomic Seeds strains together with all their Parents or Hybrids with our dynamic maps - check it out! Click here to visualize all Dr. Atomic Seeds strains including all known hybrids and descendants with our dynamic map! Here you can watch all Dr. Atomic Seeds strains and their ancestors (sorted by origin) with our dynamic strain map! Dr. Atomic is a seed breeder with half a dozen valuable varieties of pot from the far reaches of the earth. His cannabis is surely some of the finest ever grown - phenomenal in both quality and high. The history behind these genuine strains is as amazing as the buds themselves! Dr.Atomic has been on a quest all his adult life for the best genetics the world has to offer, If you want to bring your personal stash into the Atomic Age, I encourage you to obtain, cultivate and smoke the results of his 40 years of serious pot research.